Superintendent in 1870 after, yet again proving himself to be a man of great bravery, saving a boy in the frozen waters in the winter of 1869. Gordon recently found a reference to a Captain Baldwin Arden Wake on the site The Gabriola Museum in British Columbia. Gordon has found more information on Captain Wake in The Lamb Collection at Dundee Central Library. 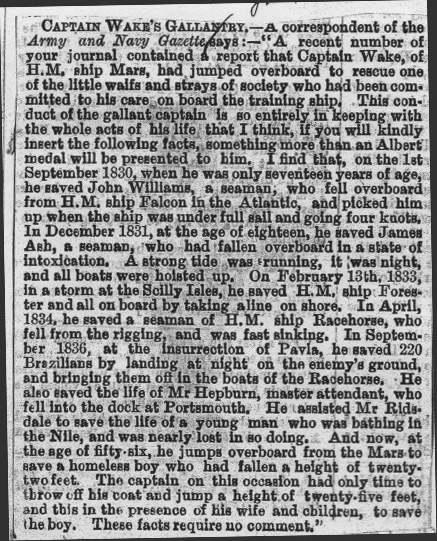 Captain Wake is also mentioned in the section "The Coming of the Mars - The Arrival of the Mars" on this website.